Use product IDs such as Model Number instead of standard product identifiers such as EANs and UPCs, which is useful if a manufacturer has a private label brand or sells specialized products that do not have standard identifiers. Who can opt for Amazon Brand Registry and how to apply? Potential candidates include traditional manufacturers, exclusive distributors of a product, private-label brand owners, creators of hand-made or custom products and producers of white-label products (branded). Resellers can also apply if they are distributing someone else’s products but need written permission from the actual brand owners. Applying for the program and its support is quite straight forward and requires a seller to complete the application located in their Seller Central Account or email at the official address. Support queries can be sent via email to brandregistrysupport@amazon.com. Once Amazon grants approval to the request, the products get uniquely tied to an account, providing an added safety measure against listing hijackers and sellers of counterfeit products. What’s needed to register a Brand with Amazon? The application to register your brand is available at Seller Central’s brand registry page. It begins with asking the basic information, including contact name, email and phone number, company website and description and finally the brand name. The brand name and other information you enter in the application should match the information that appears on the product label (without the name of the product). For example, if the product label says Jimmy’s Silverware Mighty Bowl, the brand name should be entered as Jimmy’s Silverware. While entering information for ‘Company Description,’ make sure to include all the major product categories of your brand as well as relevant keywords. After entering the contact and basic information about your brand, it’s time to get a little more specific about the brand. The next page asks for the type of connection between your company and this brand and you are presented with two choices: either you manufacture your products or you have written authorization to manage the brand. You also need to let Amazon know whether you are the exclusive brand distributor or there are also other companies distributing the brand. MPN is Amazon’s preferred identifying attribute and should be used if the part number is used by only one SKU. MPNs are also mostly printed on the packaging and in many cases on the product itself. In case you own standard product IDs and never use them on different products, the can be used as an identifying attribute and include EANs, UPCs, JANs etc. Amazon only accepts EAN/UPC codes from GS1 with your own company prefix. Products such as groceries are usually identified by their catalog number, are less discoverable than MPNs, but can still be used to uniquely identify the products. Style number or manufacturer style number is particularly useful in the clothing category and can also be used as a unique identifier. You can also use Model numbers if you are listing in the Jewelry, Camera and Imaging, Musical instruments, Shoes, Handbags and Eyewear categories. In the case when there is no eligible attribute available, a combination of the above-mentioned attributes can be used such as a combination of a model number along with a part number, year, size and so on. You can add multiple categories if needed before uploading an image of the product packaging with clear and visible branding. The final step on the page requires you to upload an image of the actual product with visible branding. Amazon requires you to have a live and ‘working’ website which could even be a one-page site containing the brand name and images of your products. However, it’s better to have an elaborate and designed site. Although Amazon does not require you to advertise your products on your website, a properly designed site always helps in making a better brand image. Submitting your brand’s website to Amazon does not mean that you can advertise it to the customers in your listings. Listing an official email address and avoiding free email addresses such as Gmail. Yahoo and Hotmail are also highly recommended. For example, if your website is jimmyssilware.com, you can use an official email address such as marketing@jimmyssilverware.com. It’s probably a good time to hire services of a professional photographer if you have been doing product photography with your cellphone. You need to upload clear images of the product packaging as well as the product itself, with clear and visible branding. You can also use the same professional-looking pictures of the products in your listings. Pictures of packaging are a must for all categories, but there are a few exceptions when it comes to the images of the actual product. If you have a product that falls into the category of grocery, beauty and health, you can submit an extra picture of the product packaging. 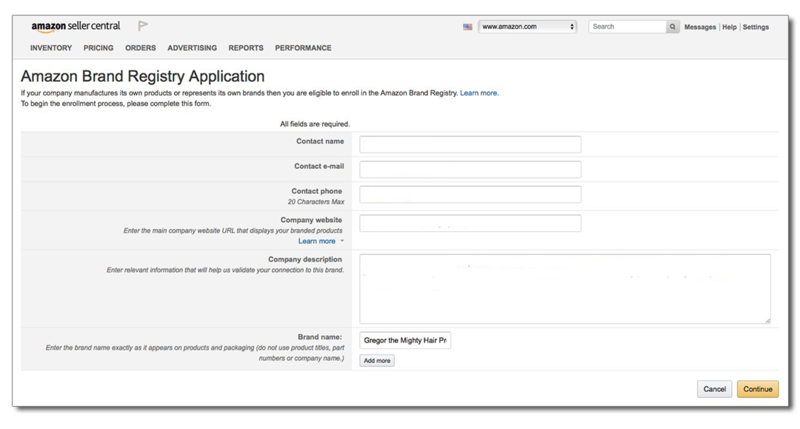 While completing your Amazon Brand Registry application, you are also required to provide a unique identifier or a key attribute for your products. You have many options at your disposal, including UPC, JAN, EAN, Model number, Style number, Manufacturer part number and catalog number. Most sellers use a UPC code unique to the product, but since it’s very difficult to change the unique identifier in future, it’s better to choose wisely and the use one that you won’t change later. You can also consult Amazon’s list of acceptable product identifiers and categories to ensure that everything is selected properly. The approval process begins after you submit the application and takes around two weeks to complete. In case you don’t hear from Amazon after three weeks of submitting the application, you can contact Seller Support for clarification and follow-up. Once the Amazon Brand Registry application process is complete, you’ll receive the GCID (Global Catalog Identifier). GCID is a unique identifier and remains tied to a particular product, regardless of the marketplace or time. If you are among the sellers who frequently change their product data, Amazon brand registry probably won’t work well for you. There are some attributes within the product data that are extremely difficult to change once the product has been enrolled. The issue exacerbates if you have a large group of products and want to keep the product data updated. Fixing listing errors caused due to change in product data is also very difficult and a big hassle and sellers are often left with two options: either remove the brand registry from affected products or remove the products for around 24 hours a recreate the listing from scratch. You’d need to download the Inventory Report to view the GCIDs assigned to enrolled products. The Brand Performance Report allows sellers to make sure that their products are not affected by the issue of ‘incomplete brand registry.’ Unlike an ASIN which is linked to a product listing and can be changed relatively easily, GCIDs are tied to products and do not change across countries or over time. If you have enrolled a product and encounter a listing error after changing the product data, it’s most probably going to be GCID related. You need to contact Amazon support to fix the issue, but make sure to indicate that the product has been enrolled under Amazon Brand Registry, by checking if it has an assigned GCID with the Inventory Report. In case you do not have a brand logo and packaging, you need to factor in additional cost for creating those. Although creating a logo and packaging would cost you extra money and time, it’s a good investment if you have a product that sells well. Instead of a short-term expense, consider it as a long-term investment into establishing your brand. You may also need some money to get your website up and running, but you can use simple tools such as WordPress, free website builders and Squarespace to keep costs down and scale as your brand grows. Amazon Brand Registry is an effective tool to help sellers grow as a legitimate brand and differentiate from others sellers. However, registering your brand with Amazon provides no guarantee that other sellers won’t be able to list and sell your products. However, it provides you with more control over the product listings. Registering your product also makes it harder for listing hijackers to list counterfeit products and helps expedite the removal process of such products. It’s easier for registered brands to get an inauthentic or counterfeit product removed as they can prove ownership of the brand.